NEW YORK—The Metropolitan Museum of Art’s audio guide program includes “Costume: The Art of Dress,” audio tour narrated by actress Sarah Jessica Parker and organized by The Costume Institute. The tour is interesting because it highlights historical costume in the museum’s permanent collections including painting and sculpture. It explores the cultural significance of fashion throughout the ages through approximately 20 works of art. In a nutshell, the scope is large but the logistics pose a significant problem, namely, one needs to possess the orientation of a homing pigeon to move from one art work to the next on the audio tour. The commentary, though short, is enjoyable without getting too didactic. Starting with the marble statue of Eirene, the personification of peace, (ca. A.D. 14–68) represented as a beautiful young woman wearing a peplos (a loose-fitting outer garment worn, draped in folds, by women in ancient Greece) and a himation (cloak), Parker describes the virtues of being able to turn a rectangle into a garment without tailoring, cutting or sewing. Once in the Greek and Roman Art wing that spans over 20 galleries, it is well worth wandering around to view the sculptures, though beware of lingering too long—by the end of the tour, it will be a case of visual overload. Moving on to the arts of Africa, Oceania, and the Americas section, the many displays of hammered gold artifacts form the pre-Columbian era are awe-inspiring in their treatment of sheet metal gold and even filigree work. Here we are led to observe the “Nose Ornament with Intertwined Serpents” (390–450) of the Moche people in Peru. Parker, aided by the curator of the section, tells us that the huge hammered gold and silver crescent was decorated with small mobile gold discs that would flutter at the slightest movement, when suspended from the nasal septum of a prominent Moche leader. Parker often defers to the curator’s voice for further elucidation on a particular garment or accessory. Among the more humorous ones is when we are asked to contemplate the four-cornered hat, dating from 7th–9th century, possibly Bolivia. The curator points out that Andes people liked to make things complicated for themselves, as this diminutive accessory, worn as a crown on top of the head, features truly complicated embroidery with knotted multicolored thread that would have taken weeks, if not months, to complete. There are many equally fascinating facts. If you’ve ever wondered how the fabric-slashing technique popular in the garments of 16th Century nobility was achieved, the curator’s voice reveals all as we are asked to view “Portrait of a Young Man” by Agnolo Bronzino (1503–1572). The serious youth is wearing a dark coat and breeches made out of silk or wool, but the fabric was slashed before being made into the actual garment. Each cut was sealed with wax so that the fabric would not continue to fray. All very useful details though it brings up the question of how such garments would be cleaned, if at all, since the age of dry cleaning is still centuries down the historical path. The tour continues with more fashion from Europe and despite the zig-zag hike through so many of the Met’s galleries, it is worth taking. After all, so much of the commentary is elucidating in a way that enriches our appreciation of the works. 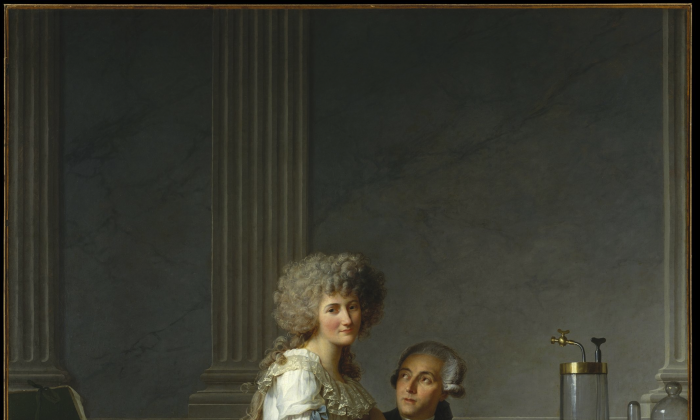 For example, the Jacques Louis David’s painting of Antoine-Laurent Lavoisier (1743–1794) and his wife Marie-Anne-Pierrette Paulze (1758–1836) dating form 1788, depicts the couple in unusually subdued, black and white garments. We are told that the dress of Marie-Anne-Pierrette Paulze is made of very expensive Indian cotton, a fabric that became popular once it was worn by Marie Antoinette. Ultimately the craze for cotton became responsible for the collapse of the silk weaving industry in Lyon and caused a catastrophic depression. While the audio tour is listed in chronological progression, listeners can sample the recordings in any order. The audio tour is meant to supplement the volunteer-guided tour, which runs Tuesday through Friday at 1:45 p.m. Clearly, a guide would make things infinitely easier and more enjoyable as one would be able to concentrate on the works. It includes interviews with The Costume Institute’s curator-in-charge Harold Koda; curator Andrew Bolton, and conservator Chris Paulocik; as well as commentary from curators and conservators from other areas of the museum. Before going on The Art of Dress tour, make sure to factor in the better part of an afternoon, comfy walking shoes and at least one coffee break. Audio Guides are available in the Great Hall or at the entrance to selected special exhibitions for a $7 rental fee. Museum members, children, and groups pay less.